N. lowii X veitchii with N. lowii to the right. Notice the hairs under the lid of N. lowii. N. lowii X veitchii lacks the hairs under the lid. Nepenthes lowii X veitchii is a gorgeous hybrid. To me, anything with N. lowii as a parent should be a great plant. As you can see, the peristome is candy cane striped and ridged. The rest of the pitcher is fairly non-discript. It would be great if the adult pitchers were hour glass shaped (from N. lowii), and a highly flared peristome (from N. veitchii). I don't know what the final output will be. I believe one of the best photos was on a website called Plants with Attitude. My plant is beginning to put out some large pitchers so that I will see what the adult pitchers will resemble. 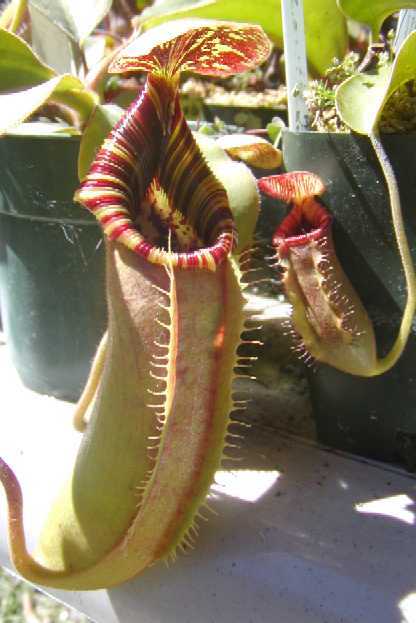 As of yet, there has been no change in shape to the pitcher similar to that of N. lowii. I grow hybrids here and there and try to focus on species, but this guy is one worth finding. It seems most hybrids are usually cheaper than species counterparts but with this hybrid that's not necessarily so. Surprisingly this hybrid has been a moderate grower for having parents that are notorious slow growers.